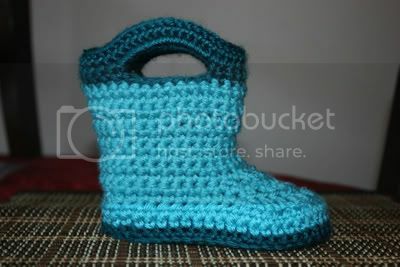 Cutest little boots designed by The Lovely Crow... I made them a little bigger for DD2 as the pattern is for baby sizes. I wish I had that talent! so cute!!!! Love them, do you have a link?? yeah is there a link? super cute now if I knew someone who could teach me how to crochet. There are no complicated stitches in this pattern... I agree YouTube has a lot of vids. Super cute and adorable! Love the colour too. Thanks We have carpet so DD2 can run around and not slip, but for those with hardwood, just put puffy paint on the bottom! I made my niece some Tinkerbell slippers and wrote her name on the bottom with glitter puffy paint and she loved it, and didn't slip and slide on the parquet floors.